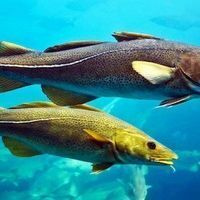 Baby fish show fewer signs of stress in the presence of large fish that scare off midsize predators. Pomacentrus amboinensisPLOS ONEResearchers from James Cook University in Australia and their colleagues have found that the presence of large predatory fish reduced stress levels in baby prey fish by more than a third, by scaring off midsize predators (mesopredators). 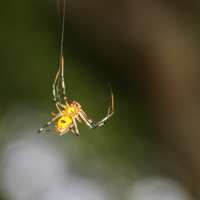 The team’s findings, published yesterday (April 27) in the Journal of Animal Ecology, reveal how ecological pressure on large marine predators can have an adverse impact on smaller prey species. 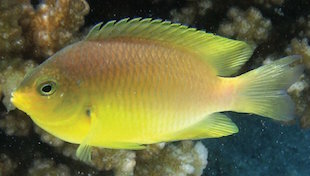 Palacios and her colleagues measured the respiration rate—a proxy for stress—of baby damselfish (Pomacentrus amboinensis) when these prey were exposed to the sight and smell of their mesopredators, dottybacks (Pseudochromis fuscus); their top predators, coral trout (Plectropomus leopardus); and another large, nonpredatory species, the thicklip wrasse (Hemigymnus melapterus). In the presence of dottybacks alone, the baby damselfish increased their oxygen intake by about 38 percent. When both these mesopredators and coral trout were present, the damselfish prey maintained normal oxygen intake. The presence of the wrasse in combination with the dottybacks had an intermediate effect on damselfish respiration.